Swing Events can be described as a particular point of an instance or behavior of that instance.For instance, clicking on a Button, entering characters on the keyboard. Here Swing Events are divided into two types such as Foreground Events and Background Events. The functionality of Event Handling is what is the further step if an action performed. Java foundation introduced “Delegation Event Model”i.e describes how to generate and control the events. The key elements of the Delegation Event Model are as source and listeners. Source is an instance and supplies data about to happen event to the event handler. The listener is also an instance and it gives the return alert in the event after the event has been received. Before this process listener should have registered on source for the purpose of alert notifications. Delegation event model overcomes the problems of hierarchical models. Below is the source code to show how the event will perform in the application. Create a class that should extend from Frame and should implement ActionListener. Create constructor that should be same as class name. Create text field, button and add ActionListener to this button. Action should perform on the textfield then it displays output as SPlessons. Output will be as follows. When click on the click button,”Welcome to SPlessons” will be displayed in the text field. Swing event classes play a major role in Swing applications and indicates the event. 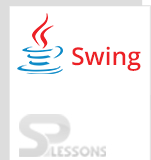 While developing an application based on the Swing technology developer can use more Swing classes depends on the requirement because Swing consists of more classes so it is a little bit hard to use all the classes in an application. Splessons will teach about commonly used classes. EventObject class is the base class and it can derive the exact behavior and state of the instance (object). It’s available in the Java. util package. Protected Object Source is the field of Java. util. EventObject, and on which only event will be happening initially. This class consists of methods also and these methods will be inherited from the Java. util. object. It is the base of the AWTEvent and it can be derived from the java.awt package. The declaration of the java.awt.AWTEvent can be indicated as follows. AWTEvent(java.lang.object source, int ID)—>Used to build the instance. AWTEvent(Event event)—>Object of AWTEvent will be constructed by the arguments. protected void consume()—->Here event will be consumed. int getID()——->Indicates the type of the event. protected boolean isConsumed()—–>It will be returned when consumption has been happened. java.lang.Strong to String()—->String indication about the object will be returned. When user click on the button it will be performed.The declaration of the java.awt.event.ActionEvent class can be shown as follows. java.lang.String paramString()—->Parameters of the String will be returned. The instance of WindowEvent will be activated when window is open or closed or terminated.The package of this class can be declared as java.awt.event.WindowEvent. The declaration of java.awt.event.WindowEvent can be written as follows. static int WINDOW_GAINED_FOCUS—>While maximizing the window. static int WINDOW_LOST_FOCUS—>While minimizing the window. static int WINDOW_ACTIVATED—>To activate the window. static int WINDOW_CLOSED—>To terminate the window. The above methods will be inherited from the java.lang.object, java.awt.AWTEvent. This event will be useful when mouse is dragged or moved. This class will be available in java.awt.event.MouseMotionEvent. The declaration of this class can be written as follows. void mouseMOVED(MouseEvent)—–>When cursor is moved it will be invoked. void mouseDRAGGED(MouseEvent)—>When cursor is dragged it will be invoked. The above all the methods inherited from java.awt.event.ComponentEvent, java.awt.event.InputEvent. This class will be use full to update or paint the methods and it will be available in the package of java.awt.event and can be declare as java.awt.event.PaintEvent.The declaration can be shown as follows. String paramString()—>Returns the arguments of the String. Rectangle getUpdateRect()—->Invokes area that should be updated. The above methods will be inherited from the java.awt.ComponentEvent, java.lang.Object, java.awt.AWTEvent. Swing Events – Listener interface should be registered with listener class. Swing Events – Event source, Event listeners, Event object are the participants of the Delegation Event Model. Swing Events – java.io.Serializable interface needs to be implemented by the class. Swing Events – int getID() is a method of AWTEvent i.e indicates the type of the event.